I AM not sure Queen Victoria ever rode a bicycle. No, not that ‘Queen Vic’, the original. You know, the Monarch? Anyway, Her Royal Highness owned an adult tricycle, but I’d guess it might have been too vulgar and troublesome to use. Besides, all that black crinoline would have been chewed by the chain before she’d been pushed off by servants. Anyway, at the time of her Diamond Jubilee in 1897, Victoria Regina would have been too old to throw her leg over a horse let alone something she’s have to power herself. Apparently, that year was also a busy year for cycling. Cambridge undergraduates burnt an effigy of a woman riding a bicycle in the main town square as a protest against the twin outrage of women riding bikes and their admission to the university as full members. At the same time, on a windswept lonely hillside near Lancaster, humble peasants were toiling to complete a hill top tower to celebrate the Jubilee. 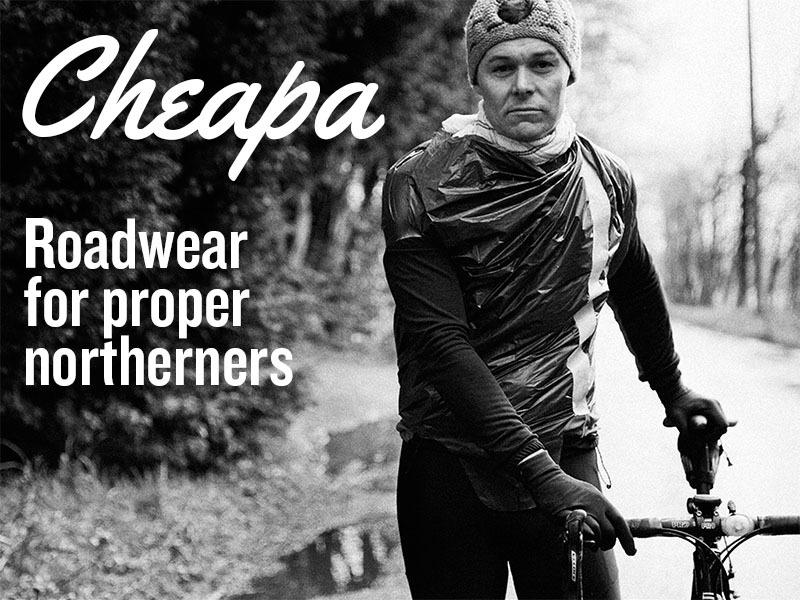 It’s given men and women cyclists a target to aim for ever since. Jubilee Tower sits on the summit of Quernmore Brow, the main route out of the village of Quernmore, over the moor to the ‘Trough’ of the Trough of Bowland itself. 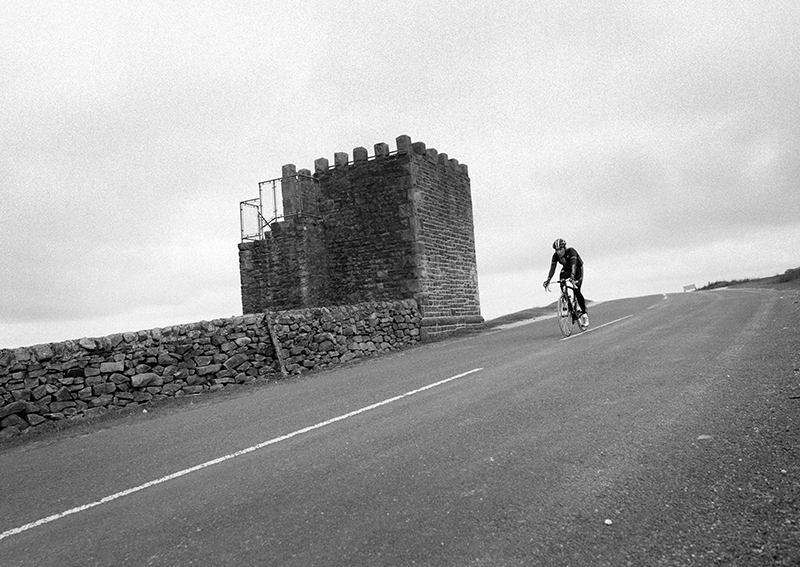 Some riders refer to the climb as ‘Jubilee Tower’ and others ‘Quernmore’ for the village at it’s base. Whatever you want to call it, it’s a bit of a stinker. On the day that we went to shoot it for Killer Hill, the Cumbrian clouds were beginning to mass on the horizon and Craig Battersby, from Team Leapfrog, looked eager to test the theory that he was only 8.5 stone soaking wet. Blimey, Craig was thin. I mean really thin. If he had been wearing a black and white kit, with a yellow helmet, he would have looked like a Belisha beacon. It was lucky that he had a helmet on, as in profile, he was difficult to see at all and the camera’s auto focus tended to miss him altogether. 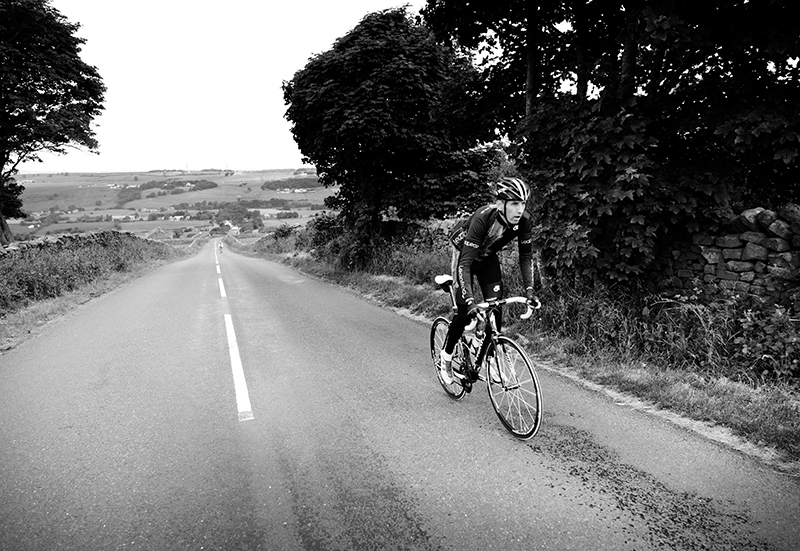 As he rode the worst stretches, returned, patiently performed a track-stand and then rode them again, I realised that choosing someone who makes hill climbing look as easy as picking daisies doesn’t necessarily make for the most epic photography. Luckily, coming up behind him, as he darted up and down, were two souls with normal BMI’s on their way from Lancaster to Wigan. They were professional Killer Hill material and making much more of a photogenic meal of the climb. In the past. I’ve often approached the climb from the South and, as you arrive at the cross roads in Quernmore, you will need to change down to a very low gear because the road steepens as soon as you turn right to begin the climb. Up through the village, there is a left-hand curve with trees on your right that mask the horror ahead. The route steepens and twists right into a second bend, which takes you immediately up to dry stone wall and sheep territory before another left-hander 300 yards further on. “That wasn’t so bad,” you think, as you turn left. 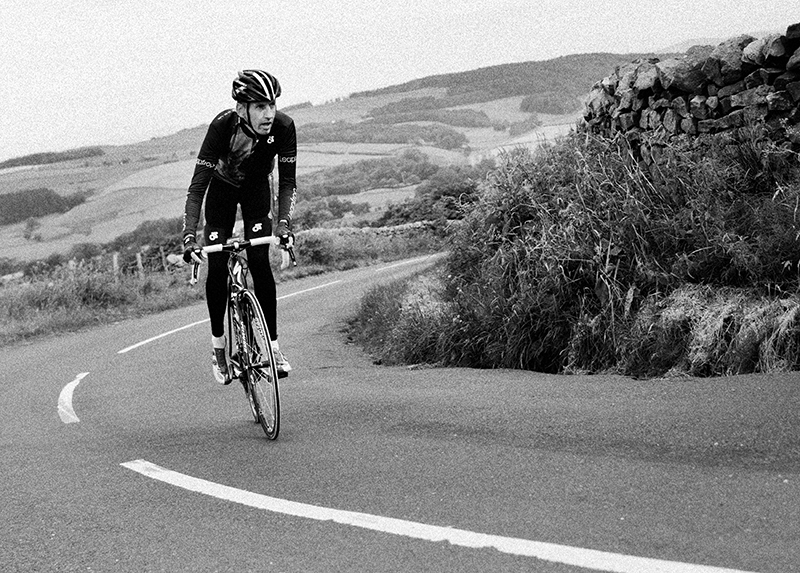 This corner is christened ‘Jesus Christ Corner’, as with already tightening legs, you gaze up a quarter-mile ramp of inconsistently tough gradient with just a tiny weeny cyclist in the far, far distance to give you an idea of the task ahead. On a hot day, this section just goes on and on… and then just on a bit more. The only saving grace is that you rarely get a head wind on the ramp, but it’s no real salve as the gradient just saps your leg strength totally until it levels off. I’ve always found the idea of classifying hills by average gradient pointless, as it’s the maximum gradient, frequency and duration that does all the damage. 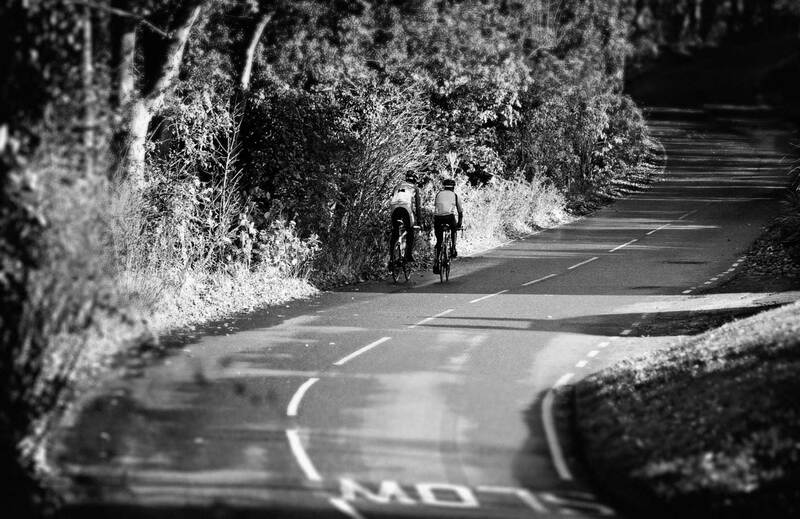 It’s no use getting all relieved over a hill with an average gradient of six per cent if it’s 20-miles long with sections at 20 per cent. Quernmore may only be 1.8-miles long but the ramp section jabs you three times in the gut with 14 per cent punches along it’s stretch – and one of those is 14.8 per cent. It is not a friendly hill. The good news about the ramp? Once you crest it, that’s the worst part over. Try to get your breathing under control, though, as there are three more steep-ish bends to contend with before a welcome patch of flat. There is even a little descent before hitting the cattle gird and beginning the long but manageable climb to the tower itself. This is all ‘a couple of gears to spare’ climbing. You may even have enough left to showboat the last 400-yards to the tower to give the impression (only to the elderly couple in the Nissan Micra) that the whole thing was a bit of a doddle. A good climb and a regular for me, ‘Jesus christ corner’ i like that, very appropriate!